No matter where we are headed to, there a few essential pieces I have noticed always land in my bag. We chatted and mulled over this list about what the items where that no matter if you were going to Antartica or Phuket it wouldn’t matter, you would still need these. I think we nailed it, but we would still love to hear your’s. OBVIOUSLY you need certain things like underwear (well maybe not depends on personal preference) and your own toiletries, but those are givens. We get asked all the time about what things we would pack for certain trips, but to be honest if you take these items whether male or female you will be set. Sure toss in a sandal for a warmer climate or dress if you are lady, but for the most part this is it. We partnered with Contiki on this story as they are doing an amazing giveaway where they are offering up one of their European trips and more right now and till the end of the week! Honestly, it is a great giveaway where they are giving away $250 ASOS gift card and a trip. See their promotional page for more info. Even if you may not win or don’t want to enter a giveaway they are offering 10% off 18 different European trips right now. The giveaway is only open to U.S. Residents. Every trip has a moment where you need to get dressed up on some level. There is nothing that can make you look put together like a nice crisp white button down with a good pair of jeans. Or if you are at the beach layer it over your bikini as a cover up. Style only goes so far when you are traveling. Shoes take up a massive amount of space in your bag so I always am on the look out for shoes that not only are cool, but I can walk forever in. Sneakers are in style these days so take advantage and rock some slip ons such as these. They will work well in airport security and they will keep you comfy while you try to see a city in a day. It is an absolute staple of any closet. The lightweight cotton fabric will keep you cool and dry even in hot locations while also providing a key staple for even colder climates. This is an absolute necessity no matter where you plan to head on your trip. I am a strong believer in the lightweight army jacket. If you are in a cooler location, layer a tee, button down (chambray), and your sweater under this jacket with a scarf. If you are in a warmer location, use it in the evening to place over your dress or short and tee combo. A scarf can do so many things. If I was on Naked and Afraid I might consider this as my one item that could come with me. But for real. You can use it as a pillow on the flight or train, a top in a warm location, a skirt, or even just as a scarf. It is amazing what you can do when you have a good scarf. I never leave home without my favorite jeans. I have tried many pairs of pants, but I still come back to Gap. They fit the best, wear well, and well just are darn good for the price. No matter what I don’t leave home without one. I don’t suggest using a wool one, but a cashmere or cotton sweater that breathes well and can be used in varying climates is the way to go. Nothing more classic. Jeans a white tee is the go-to outfit for Mike and I. Enough said. The bag is the key thing. Finding one that works well for your trip is essential. Bonus if you can fit everything in a backpack that you can use during the day while you are seeing the sites. Even if you are in a cloudy city a good pair of sunnies can make all the difference in the world. We are always bummed when we leave home without our favorite pair. If you need more ideas on what to pack for your trip or want to see what we have packed for trips in the past see all of our packing posts here. We would love to hear what you would add to this list or takeaway! We always find it interesting what people consider important essentials for travel. This post is sponsored by Contiki and Travel Mindset. All opinions and thoughts are our own. As always thank you for supporting the brands that support The Fresh Exchange. Cool posT, i MET A FEW PEOPLE FROM CONTIKI ON MY HOLIDAY TO GREECE AND THEY SEEMED REALLY COOL AND HAPPY WITH THEIR EXPERIENCE. 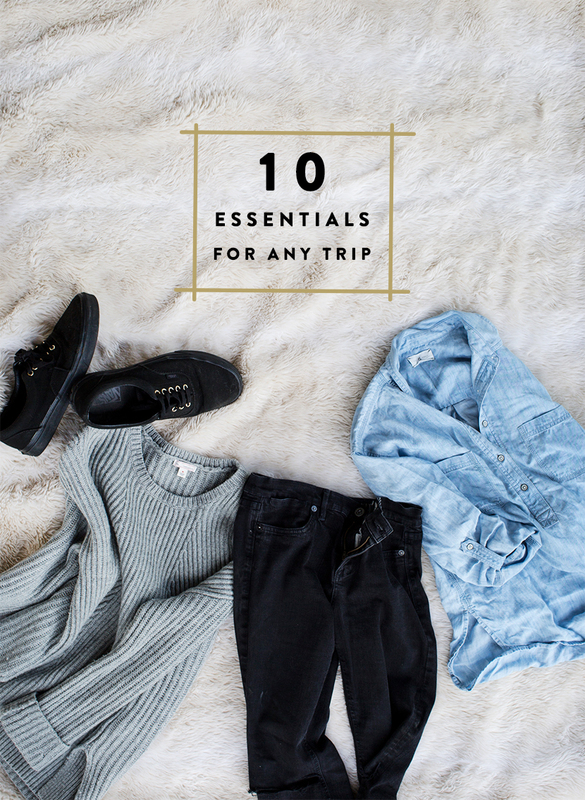 These are great picks to pack along on a trip! I always make sure i have a white button down shirt, a chambray shirt, some comfy tees, skinny jeans, and a dress or romper with me when i travel. Of course, a great bag and some basic layering pieces goes without saying. Great tips! I took a contiki tour last year and it was super fun- both relaxed and high impact at the same time (if that’s possible!) I love the scarf you chose, I think it adds the perfect pop of colors without going crazy and looking like “that scarf” in every travel photo! I would add a pair of Unripped dark wash jeans. Can be styled up or doen with accessories. But other than that you naIled it! I lived in London the last three years and travelded the world. What you have giveN us is gold.